One of the most important aspects of Veeam Cloud Tier is its advantage over competitors from a cost perspective. Believe it or not many backup providers will actually “double charge” for the data you store in the cloud. What this means is not only are you paying for the cost of leveraging the cloud provider’s storage but also incurring an additional charge from the backup provider simply for leveraging object storage with their solution. Veeam Cloud Tier is built into our existing Veeam Availability Suite Enterprise and Enterprise Plus editions and you will never see a “cloud tax” fee from Veeam on your bill! More importantly, no matter what object storage you choose, we don’t hold your cloud data hostage like other backup providers. At any point in the future, your archived backups can be imported from object storage and restored using FREE Veeam Backup & Replication Community Edition, all without requiring a paid Veeam license. The built-in storage reduction technique is truly what sets Veeam apart from other solutions. We know that customers don’t want to have to send their entire backup to the cloud, or bring it back down for that matter… So, we developed a technique by which the on-premises files remain on-premises as a shell with metadata while the bulk is offloaded to object storage. This drastically reduces the size of the local storage without sacrificing any recoverability of the data. For instance, a 1TB VBK file on local storage could be reduced to a 20MB file. Moreover, thanks to forever-incremental upload effectively providing source-side deduplication, customers incur only minimal cloud-based storage fees for offloaded data. 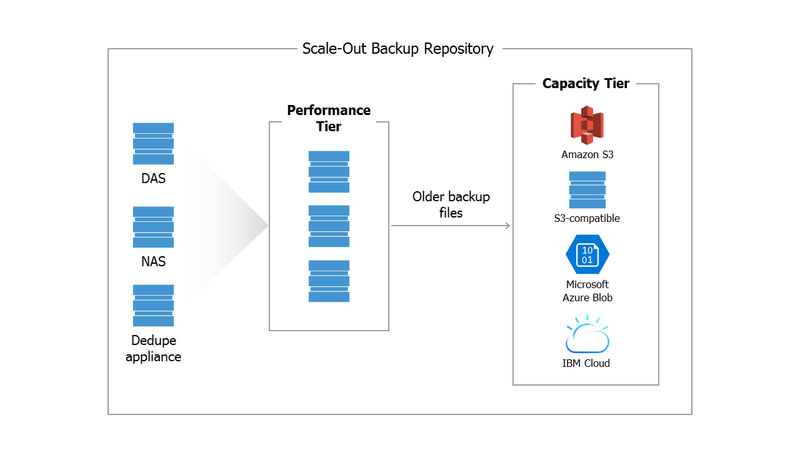 They can also just as easily retrieve data from the cloud without having to recover the entire backup repository through Veeam’s file-based granular recovery options — minimizing egress charges and increasing productivity.